« Beauty of Bath: is it worth the space? Quince Tree: why is its bark peeling off? I have a question about the bark on the quince tree, which I noticed yesterday is coming off in quite large sheets. The wood beneath is smooth. I can see that this has started at the base and is working its way up the main trunk. Would anyone have any idea what the cause is and whether or not it is a natural growth thing (I fear not) or the result of some disease? And if the latter, can it be treated? (I also fear not!) The tree otherwise looks healthy. The leaves are still green and not blighted, although the backs some of the leaves have many tiny black spots on them. There was plenty of blossom in the spring but very little fruit appeared and what there was fell off some time ago. But I put that down to the sort of weather we had in the spring and early summer. You do not have anything to worry about. It is not a disease. 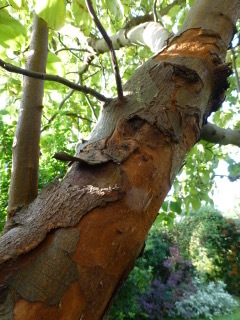 Shedding of bark is quite normal in quince trees. It also occurs in some other species – plane trees for example shed bark in a very similar way. Bark is dead material and its only use to the tree is protecton of the cambium, a thin layer of living tissue immediately below it. It is slowly lost and replaced (rather like our own skin) either as in most species in a slow inconspicuous way or in a more dramatic way as in quince trees. The important thing is that the wood below and the new bark looks healthy and firm. 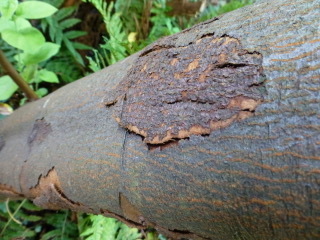 The new bark has a different colour and is smooth because it has not yet had much exposure to the elements. If the bark were to come off exposing soft unhealthy looking wood underneath that would have been a very different matter. It would have been a sign of canker or other disease. That clearly is not the case in your tree. As you also say your tree looks perfectly healthy otherwise. The black spots on some leaves are possbly due to leaf blight but your tree is not seriously affected. No quince tree will have completely spotless leaves in early autumn. The loss of fruit has nothing to do with the bark shedding. I am sure that your own conclusion that it is probably due to weather conditions is the correct one. Thank you so much for your reassuring explanation.